Blake Healy, director of the Bethel Atlanta School of Supernatural Ministry, has a spiritual gift so incredible it's almost hard to believe. Healy can see in the Spirit. Or as he puts it, "Since I was a kid, I've seen angels, demons and other spiritual things the same way I would see you if you were standing in front of me." Whenever he shares his gift with others, he's greeted by a litany of questions. Some are curious: "What do you see in this room right now?" Some are skeptical: "Are you sure you're not a paranoid schizophrenic?" Some are even personal: "Is it hard for you to witness all that demonic activity?" That last query generates the most surprising reply. Healy says the demons used to scare him when he was a kid. From ages 9 to 12, he remembers experiencing tremendous fear every single night because he could see demons enter his room. He was tormented by them. The nightly attacks only ended when Healy and his family began attending a Spirit-filled church that recognized and validated his gifting. Now, Healy says, he's tormented by something far more common than demons. "The truth is, I'm usually not all that bothered by the demonic things that I see, because I've seen a lot of the plans of the enemy, and he only has so many of them," Healy says. "It's also not too hard to see spiritual wounds, because I can feel the plan God has to heal every single one of those. The most challenging thing to see in the Spirit is when I see just how much of God's goodness He pours out on His people, and how much of that goodness goes unclaimed either because we don't know it's there or we don't know it belongs to us." That tragic reality prompted Healy to write his second book, Profound Good, released in February by Charisma House. He says all of his supernatural experiences deepened but ultimately simplified his understanding of God's character. His book is based on a simple idea, devoid of any frills, dramatic twists or prophetic revelations: "God wants to know you, and God wants to be known by you." "That's it," he laughs. "That's the 'profound good.' That's the secret ending. But for me, and hopefully my readers as well, the journey of what that actually means and how that manifests in our life can be transformative." Today he's using his gifts and insights to help both his Bethel family and the broader body of Christ. Chuck Pierce, president of Glory of Zion International, says Healy's teachings have helped many prophetic seers in his own ministry. "A major portion of our ministry has to do with releasing prophetic insight and intercessory revelation," Pierce says. "Blake Healy's [first] book, The Veil, came into our path last year, and upon giving this to several of our intercessors, I saw the fruit of it. They were greatly touched by what Blake shared, and it gave verbiage to what they experienced. We've hosted two large gatherings here where he has ministered, and both times, he was a favorite of the entire congregation. I found he had such a credible way of presenting his testimony and then ministering his gift. I found him very authentic and not pretentious or showy at all. Blake has a very genuine seer gift, which is one of the prophetic dimensions that God activates within us." Healy has been able to see in the Spirit for his entire life. He says his first memory involves sitting in the car while his mom chatted with a teller at the bank's drive-through window. Worship music played over the car radio. Healy says he saw "a half-dozen baseballs of light just kind of drifting back and forth with the music." He says they were angels. Though Healy was raised in the church, his church did not believe in the ongoing gifts of the Spirit, so he kept his visions to himself. He says his parents didn't think much of the unusual things he'd say, branding him as "imaginative." Healy was 12 before his family began attending a charismatic church that trained people in the prophetic and the gifts of the Spirit. "It was the first time I ever heard anything that gave context to these things I was seeing," Healy says. "And when I did, it finally gave me the courage to fully share what was going on with my parents and the church leaders there. Because up until that point, I had just told them I was scared. I was scared of what would happen if I told them I was actually seeing things. The amazing thing was that as soon as I shared with my parents and learned that what I had was a gift, all the nighttime terror stuff completely stopped over the course of a week." Healy has since come to meet others with the gift of seeing in the Spirit. When he first told the elders at his church about his gift, none of them could relate. Even though they believed him and knew secondhand of some people who had similar experiences, no one could relate to what he was going through. He felt alone. That changed when he attended the Bethel School of Supernatural Ministry in Redding, California, where he met six other similarly gifted people. Then, after he self-published his first book, The Veil, he received thousands of emails from people who had seen in the Spirit or had children with similar experiences. Now, Healy believes seeing in the Spirit is a relatively common gift, but one many recipients shut down because they feared or didn't understand it. "I believe the gift of seeing in the Spirit is meant to be available for every Christian, because I believe every gift is available to every Christian," he says. "I believe that because of how much God wants us to know Him and how much He wants to reveal His nature to us. For me, the answer to the question of 'Why can I see in the Spirit?' is because God wants me to know Him. That's why I can see in the Spirit. That's why you can see in the Spirit." But will those same two people see the same thing? Not always, according to Healy. Sometimes he and another seer will witness the same thing—which Healy calls "a fun validation experience." But other times they may see dramatically different things. Healy says that's not because one of them is a fraud or mistaken—it's because their perspective is limited. "Take any room," he says. "Cup your hands and put them over one eye. If you look around the room, you could notice something and go into a lot of detail about how that light switch works, what kind of lighting fixture that is or what kind of door handle that is. But you could totally miss this window that has all this crazy nature outside of it or this intricate thing on the floor. All this to say that because there's so much going on in the Spirit realm, it's very understandable that two people who have similar gifts might just be, if you will, zooming in on completely different things." So how does that "zooming in" process work? Healy says it's difficult to explain exactly, hesitating to describe it as either fully automatic or fully intentional. He instead compares it to his morning commute. "It's not so different from when you're driving," he says. "You can look through the windshield and see the road, cars and signs, or you can focus on the windshield glass itself. And when you do that, you can see maybe some water spots, some small cracks, little particles of dust—things that are always there but if you're not focusing on them, you don't really see or think about them at all." Today, Healy is comfortable talking and sharing his giftings with the church. 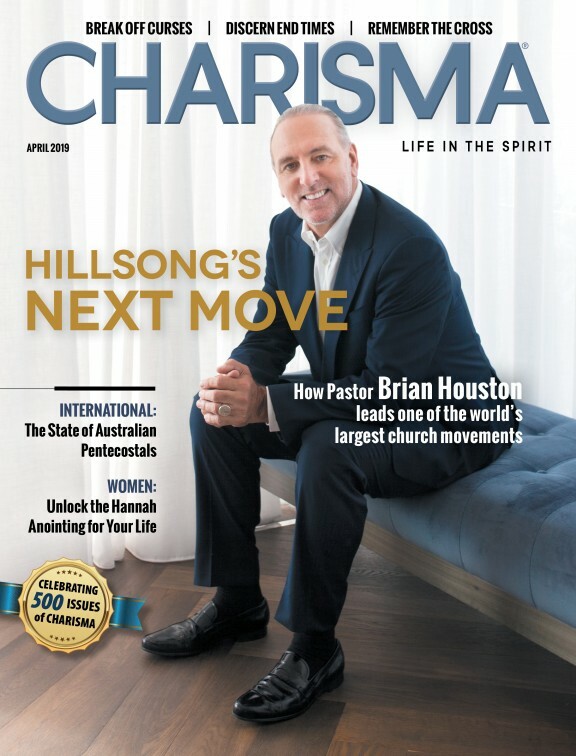 His supernatural anointing and gifting has been lauded by major charismatic leaders, including Bill Johnson, senior pastor of Bethel Church in Redding, California. "In past generations, the Lord poured out His anointing on individuals so that His goodness and power would be displayed to His people," Johnson says. "Entire generations were impacted by the likes of Smith Wigglesworth, John G. Lake, Kathryn Kuhlman and countless others. People came from around the world to receive from their ministries and to experience the presence and works of God for themselves. These heroes of the faith were amazing gifts to the church. "But in recent days, there has been a shift. It's not that God has withheld His anointing from individuals. It's that He is now pouring out His anointing on individuals who are positioned to equip a generation. God's desire is for His entire body to manifest His power and love, reaching the whole world through the beauty of the gospel. Blake Healy is one of these empowering individuals. His focus is not only on what God has for him individually. It is also on the awakening of the body of Christ, that it might reach its full potential." Yet despite that powerful anointing, as a child, Healy hesitated to share his gift with his friends or family because he couldn't articulate it. He would see angels dancing in worship or standing guard at a certain door, but those visions would fill him with feeling far surpassing what he'd actually seen. He occasionally fumbled at words, coming closest with his description of these visions as "rich and nutritious," but mostly stayed quiet. Now he has the words for what he sees. "In every single thing that I saw—every single angel, every single move in God's presence—I was seeing how every single thing in the Spirit points back to God," Healy says. "Even the negative stuff—if you stood at the right angle and looked at the right place, from God's perspective—would actually reveal more of His glory. Every single one of those things was an invitation to know Him more and to know His goodness and His kindness." Healy believes that invitation extends to every son and daughter of the King. He says every gift—including seeing in the Spirit—is available to every believer because of their role as a child of the King. "If I'm only a servant, then I just need the gifts and the abilities that are necessary for me to accomplish my job," Healy says. "If, however, I'm not only a servant but I'm also a son or daughter, then all of a sudden, it shifts. I don't just need to know my job, but I need to know how my Father's kingdom works. I need to know how my Father works and how He thinks. And in that context, the idea of every spiritual gift being available makes a lot more sense. Rather than just asking, 'Why would I need that if I don't need to do anything with it?' or thinking, The Lord isn't assigning me to do something specific with that, those giftings will make a lot more sense if part of my assignment is to know Him and the way He works." One more question people frequently ask Healy: "Because you see in the Spirit, is it really easy to have faith? To make all the right decisions?" "Definitely not," Healy says. But as he elaborates, it becomes clear he is less interested in results than the process. To borrow the expression, he'd rather God teach him to fish than give him a fish. When he was dating April, now his wife, Healy says he specifically avoided asking God, "Should I or should I not marry April?" Instead, he asked God what to ask Him. "Instead of talking to me about the answer for my relationship with April, He started talking to me about the nature of someone who loves," Healy says. "Out of that, step by step, I learned what my answer with April was. Not only in whether I should marry her or not, but also how I should continue to engage in my relationship with her and how I can keep growing in connection with her." That unconventional, holistic approach—learning how to be a person who knows the answer rather than learning the answer—informs his own teaching style at Bethel Atlanta's School of Supernatural Ministry. Healy says he likes to teach the same way God teaches him. That means he's more comfortable than the average Christian with a level of mystery and mysticism, though he strives to avoid vagueness for vagueness' sake. He hopes his answers spark rather than end conversation. "I kind of start broad and go narrow, when [training people to] use these gifts," Healy says. "We're trying to use them out of the character and nature of who God is. So we're using them in a way that's kind, that's just, that points people back to Him and doesn't point people back to us. We are first making these gifts about connection with our Father, and then out of the overflow of connection, it pours out on other people." But that doesn't mean the interpersonal aspect of spiritual gifts is an afterthought. Rather, Healy says, "every spiritual gift is meant to function in the context of community." A gift properly used should not bring discord between people or cause dissent. When that arises, Healy says, correction is necessary, but that correction is never an order to stop operating in the gifts. "We want to create a culture where it's OK to give feedback, where it's OK to hear from other people about how the way that we're prophesying and operating affects other people," he says. "We don't want to get too defensive or too precious about the way we deliver things, so much so that we don't hear about how it's impacting other people." Most of all, Healy wants fellow believers to learn the same reality he's learning—that the supernatural and the natural exist in one unified ecosystem, and we cannot ignore one world in favor of the other. He says his ability to see both worlds lets him see how truly united they are and how physical events often mirror or act in response to spiritual events. "For example, I've seen situations—on the negative side—where you see a demon trying to [mess with] someone," Healy says. "Maybe a friend of theirs was rude to them. So the enemy's trying to enhance the offense and the hurt that can come from that kind of thing. Maybe I'll see that demon creep up and poke that person in the eye or jab a finger in their ear. I watch as the person physically responds to that spiritual stimuli, and they'll flinch or cringe or rub their eye. What do I imagine happening in that moment? I imagine a memory of what that person said kind of spiked for a second, or you just heard a lie about what that person believes about you or what they think about you. It's normal to have some kind of physical response, and it's interesting to me how tied those two things can be." So how can the church become more attuned and attentive to this parallel spiritual reality, which is impacting our physical world every minute of the day? Healy says it starts by destigmatizing the supernatural, especially among children. "I think a lot of kids see in the Spirit but—simply culturally—we learn to dismiss spiritual things that we're starting to see," he says. "Whether it's telling your kid, 'Oh, stop being silly,' or 'Stop telling lies,' or 'Oh, that's just a story.' Obviously, kids have imagination, and it's possible for them to imagine things. But kids learn, 'Focus on the physical world—this is real, and this is what you need to pay attention to.'" Healy says others shut down or never develop their gifts because of this cultural stigma. He's heard from many people who have never fully seen in the Spirit, but remember a couple of weird phenomena in their lives—a time they saw the outline of a man at their church or an amorphous figure in their bedroom for a split second—that they dismissed because it was confusing or weird. Healy says the best way to develop the gift of seeing in the Spirit is to not simply brush off these encounters. Instead, lean in. Pay closer attention. Be attentive to what the Holy Spirit may be doing and saying around you. And whether you see the supernatural realm or not, remember that the real point is intimacy with God and understanding His character. "This stuff isn't cool and crazy for the sake of being cool and crazy," Healy says. "You know, it's fun seeing angels. It's fun hearing stories of spiritual warfare, where angels are fighting demons and cool stuff like that. But that's not the point. The point is we're being invited to understand who our loving Father is and that all these things point back to connection with Him. "Without that, they're just fun 'cool stories.' But when we focus on our relationship with Him, they're an invitation into the gospel."